A new release 7yuv V1.8 has just been uploaded to the Datahammer website. 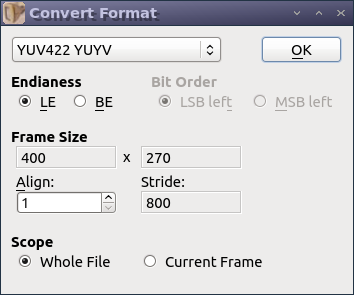 Apart from small bug fixes and tweaks, a new feature for graphics formats conversion has been added. 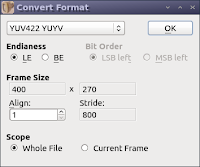 In this version most YUV and RGB format pairs can be converted to each other, however a few exotic combinations are still missing. Missing combinations will be added in the next version. Also it is now possible to configure mode colour schemes, this will become more useful as we add more text-based edit modes in future versions.